My son had a cardboard kitchen that he loved, and played with for hours. One day he wanted to take it outside, so his friends could play with it too. But here is a great idea - and it will last much longer too! If you ever see an old TV Entertainment unit tossed out to the garbage, grab it! Or got one collecting dust in your basement? 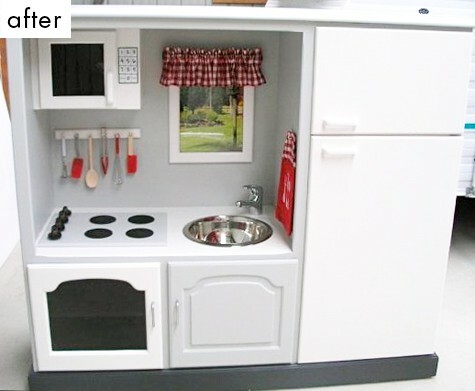 With just a bit of paint and hardware, it will make a wonderful kitchenette for the little one(s) in your life! Check out these Play Kitchenettes on Amazon.